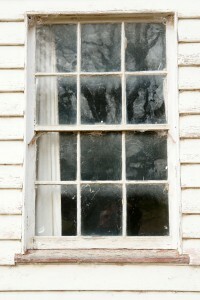 Old window pictured: If your window looks like call Accurate Siding & Windows immediately! Leaky seams, loose panes, and cracked glass force your furnace to run constantly are common tells that you may need to replace your windows. Try performing these five tests. Window components should be tight and secure. Try shaking them gently. If any window pieces rattle, it means it is not sealed tightly, which air seeps in. Storm windows in particular are key culprits. When they get loose, they don’t protect as well as they should. Look for daylight around the window frame. Whenever you see light coming from the outdoors, you can be sure cold air is coming in too. You can fix this yourself by caulking or weather-stripping the seams. No cracks in plain sight. Look the windowpanes and make sure none of the glass is cracked. Even tiny fissures can leak air. If you’re finding cracked panes, it’s a big sign the windows need repaired or replaced. Seal all doors, windows, and vents, and turn on all kitchen and bathroom exhaust fans. Get a candle or a lighter and have it near the window, if there are leaky areas will draw the smoke. Make sure your windows close and lock properly. The locking mechanisms help the windows form a seal by putting pressure on them. This ensures they’re fully closed, with window edges coming into full contact with their seals. A wide variety of replacement window products are available today, in a large range of insulation factors and features. Many people don’t know this, but there are even replacement window products available now, that have blinds or shades built right between the panes, allowing you to decide how much or how little light gets in, and since the blinds are actually inside the window, they won’t ever need to be dusted or cleaned. Another great feature is what they call a tilting sash, where the entire window can be laid down to allow you to clean the inside and outside with ease. Imagine the headaches you can avoid when you have to clean the windows on an upper floor, or in places where it’s hard to get to the outsides of the windows. Whenever people talk about window replacement, we almost always hear about triple pane windows and, yes, they are great, but they also aren’t the only thing available. It’s a good idea to talk to the contractors in Virginia Beach to see what replacement window product is right for you. When all is said and done, your energy bills will let you know if you have made a sound decision. With any questions or to request a quote: Visit our website www.accuratesidingandwindows.com under the Contact tab or give us a call +757-301-6972. Accurate Siding & Windows, Inc., performs the following services using the finest products in the industry: Replacement Windows, Vinyl Siding, Decorative Vinyl Siding, Vinyl Replacement Windows, Double Hung Windows, Casement Windows, Insulated Windows, Alcoa Siding, ThermaTru Doors, Nailite, CertainTeed, Crane Siding, Simonton Windows, Dove Vinyl Windows, Andersen Windows & Doors, Fiberglass Entry Doors, Contractor Services, Siding Contractor, Vinyl Siding Virginia Beach, Vinyl Windows Virginia Beach, Home Improvement, Home Improvement Virginia Beach, Window Products, Replacement Windows, Entry Doors, Window Replacement Contractor, Window Replacement Company. Need Virginia Beach window replacement? Accurate Siding & Windows, Inc., are contractors in Virginia Beach, which performs the following services using the finest products in the industry: replacement windows, window Install, Vinyl Siding, Decorative Vinyl Siding, Vinyl Replacement Windows, Double Hung Windows, Casement Windows, Insulated Windows, Alcoa Siding, ThermaTru Doors, Nailite, CertainTeed, Crane Siding, Simonton Windows, Dove Vinyl Windows, Andersen Windows & Doors, Fiberglass Entry Doors, Contractor Services, Siding Contractor, Vinyl Siding Virginia Beach, Vinyl Windows Virginia Beach, Home Improvement, Home Improvement Virginia Beach, Window Products, Replacement Windows, Entry Doors, Window Replacement Contractor, Window Replacement Company, Window installation service. Window glass replacement service. Replacement windows Virginia Beach. Need home window replacement to replace my windows. Replacement window companies with window installers that deliver high quality material and great window installation service. #1 window replacement Virginia Beach. window installer for window installation Virginia Beach. Home Improvement Virginia Beach, Virginia Beach 2009 Tax Credit, 2009 Tax Credit, 2009 Stimulus, Home Improvement Tax Credit, 2009 Home Improvement Tax Credit, Chesapeake 2009 Tax Credit, Hampton Roads 2009 Home Improvement Tax Credit. Virginia Beach contractors, Virginia Beach window companies, window installation companies, we are all of these. We are replacement windows Virginia a window installation company.